« Happy Dutch-American Friendship Day! Update: Rest in peace, Vollis Simpson, who died at home in Lucama, N.C., on May 31, 2013, at the age of 94. The state fair left Raleigh a couple weeks ago, but there’s a midway of sorts you can see year-round over in Wilson County. The display, plucked down amid pine trees and tobacco and cotton fields, is a startling sight if you’re unprepared. The sky suddenly fills with a carnival of contraptions, some of which resemble Ferris wheels, carousels, and kids rides. Colorful parts move excitably in the breeze while the sounds from dozens of spinning wheels clatter and click out a wind-powered melody. 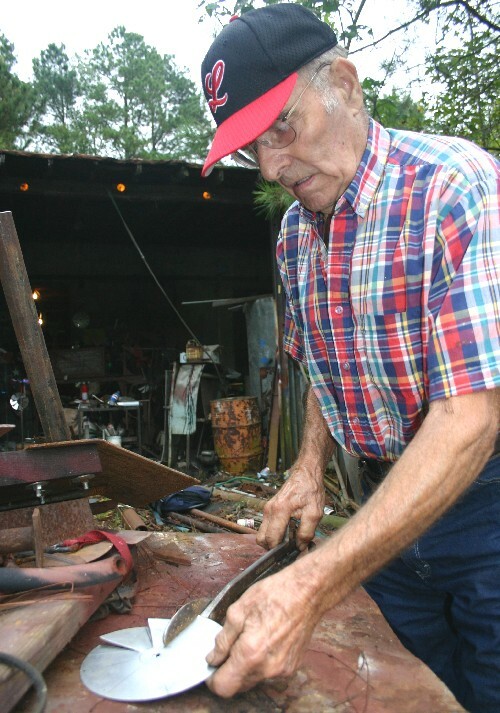 Simpson, a lifetime tinkerer, machine shop owner by trade, and artist in “retirement” seems to take his fame in stride. You can ask him yourself if you stop by his workshop near the intersection of Wiggins Mill Road and Willing Worker Road. You’ll have to maneuver through a few piles of metal, fans, fan blades, bicycle wheels, buckets, radiator covers, and more to reach his work space. We visited on a Sunday afternoon, and, as usual, Simpson was working. He wiped the smudge off his large, lined hands with a rag and held one out for a shake. He advised his visitors to speak up, as he doesn’t hear so well these days. Simpson, wearing his usual jeans and a plaid shirt speckled with paint, led us into his field of dreams. His bigger works are worth $10,000 and up. (Not that they’re for sale, though he does still fill custom orders.) He also has a shed full of smaller pieces for the tabletop and yard that he sells from $100 to $200. The house Simpson shares with Jean, his wife of 58 years, sits back behind the field holding the whirligigs. One son, Michael, a mail carrier, lives in a separate house on the family property, the same farm Simpson and his 11 siblings were raised on. His daughter, Carol Kyles, a social worker, lives up the street, and his other son, Leonard, a TV newscaster, lives in Greensboro. 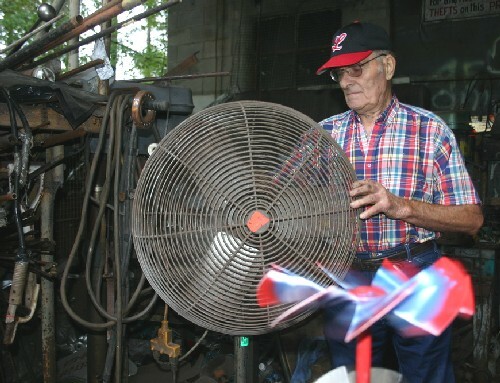 Simpson’s first wind machine was built during World War II. “To wash clothes I fixed me a little motor for a washing machine,” he said, as if a wind-powered washer built from B-29 parts was nothing special. Not until retirement did he make another whirligig. “I worked 30 years and didn’t build the first one. But when I stopped work, I couldn’t sit down in the house and watch television,” he said. Gazing skyward, Simpson looked at the complex works filled with metal parts. His favorite, he said, is the one with a wagon, driver, and horses, all moveable pieces. And though he might be the one to put the parts together, but “the old master does the movement,” he declared. One of their favorite folks is Rebecca Hoffberger, director of the American Visionary Art Museum in Baltimore, who occasionally stops by on the drive to Atlanta, where she has relatives. 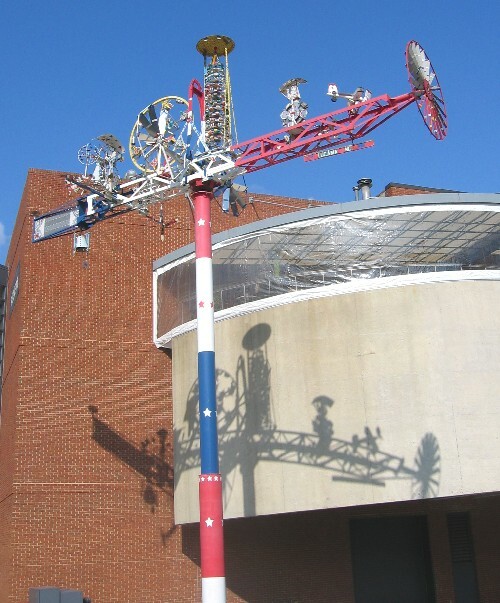 The museum, which specializes in outsider art, has two commissioned pieces from Simpson, one weighing in at 6,000 pounds. Hoffberger can’t speak highly enough of Vollis and Jean. Simpson said he’s not sure if he‘ll make a second visit to Baltimore, not being the traveling type. (The first trip there was by bus with about 60 kin, he said.) And though he’s relatively healthy, he’s had had some close calls the past couple years. He had quadruple bypass surgery two years ago, and earlier this year he was injured when his shirt caught on fire while he was welding. 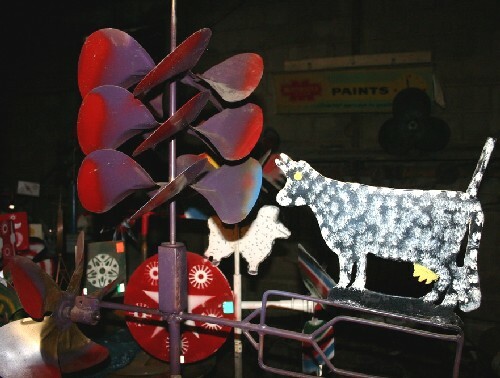 Visitors can browse through the hundreds of small whirligigs vying for space inside his shop. The “showroom” is lit by only a few naked bulbs hanging from a wire below the ceiling. Aside from the works commissioned by Wilson, Simpson focuses on the smaller pieces these days. “You start something big and die and nobody knows what to do with it,” he said. 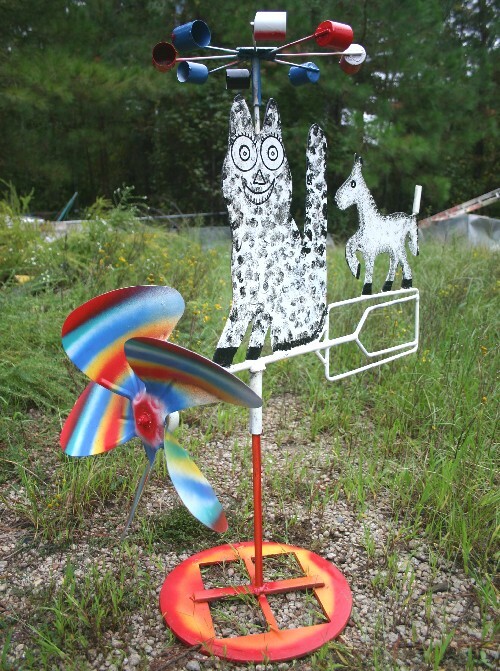 Simpson’s whirligig farm is at the intersection of Wiggins Mill Road and Willing Worker Road in Lucama, NC. This entry was posted on April 22, 2010 at 2:39 pm and is filed under Art, North Carolina. You can follow any responses to this entry through the RSS 2.0 feed. You can leave a response, or trackback from your own site. Done on the phone. Thanks! Wanting to know if Vollis Simpson is still on the same property in Lucama and can I visit and bring a child? As far as I know, he’s still there. People just kind of show up — definitely children are allowed. It’s worth it just to drive by, even if he’s not home. Let us know if you do! So very sad to read of his passing in the news today. I had hoped to visit him and his marvelous midway. I still plan to go, but fear it just won’t be the same. Loved your article. Thanks for sharing. Carolyn, I am on the road and didn’t know this yet. I’m so sad. Vollis was such a lovely man — generous, creative, humble. 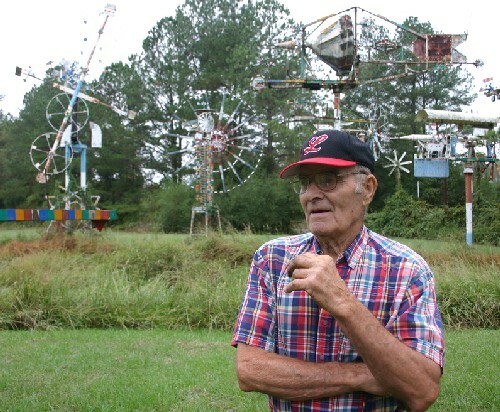 His midway is not actually still there — he denoted much of it to the City of Wilson and they are opening a wonderful whirligig park in his honor next year. It is a fitting tribute. How much more amazing the world is because of Vollis’ art. I wish I could have met him. I have only seen pictures and some video of his whirligigs, but have completely amazed by the images alone. Intend to make the trip to Wilson. May he rest in peace.